The concerto for Percussion and Orchestra, op. 70 received on the 16th January, 2003 in Turin with Peter Sadlo and the Orchestra Sinfonica Nazionale RAI under John Neschling its 100th performance! Although percussion instruments have in recent decades enjoyed more and more emancipation in a solo role, the chances of a percussion soloist being included in a concert for a season-ticket audience are still relatively small. In my opinion, this has less to do with a lack of top-class percussionists than with a lack of suitable repertoire. With my Percussion Concerto, op. 70, I have attempted to address this situation. In 4 movements full of contrasts, the solo part uses metal, membrane and wood sounds as well as the pitch-determining sounds of marimba and vibraphone in patterns of motion varying from pure, partly meditative plays on sound to virtuoso figuration. The orchestra has a normal complement (triple woodwind) and is not so much conceived as accompaniment but rather as being closely enmeshed with the sounds and motions initiated by the percussion, receiving however greater independence in the large-scale symphonic developments. In the 1st movement - an Adagio with introductory character - metal and vibraphone sounds predominate. These comment on a broad gesture of the orchestra which appears twice in differing settings and marking clearly the formal divisions of the movement. The Allegro vivace is a burlesque interplay between soloist and orchestra of motor-like drive. Towards the end, the percussionist has the opportunity for an extensive cadenza, a brief coda concludes the movement. The Lamentation - a homage to Dmitri Shostakovich - shows meditative tendencies. From a solo cadenza, various episodes develop. A large-scale symphonic build-up leads to a climax positioned at the so-called sectio aurea. A closing section recalls the atmosphere of the beginning. In the Finale, the virtuoso element is in the foreground, primarily with the marimba. Quasi improvisatory insertions interrupt the forward urge of the movement. 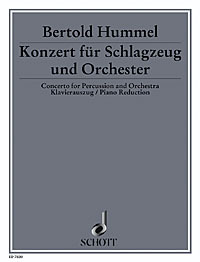 Bertold Hummel's Concerto for percussion and orchestra Op.70, which was written between 1978 and 1982, was first performed in Regensburg in 1985. Since its premiere, the work has been performed over 100! times in Germany and elsewhere, and has received an enthusiastic reception rarely accorded to contemporary Classical music. The success of the Hummel concerto is not hard to relate to: the composer managed to create a piece that is not only highly rewarding for percussionists, but also has considerable musical substance. In particular, he manages to resist the above-mentioned seductive powers of the instruments by exercising exemplary discipline and applying strict organisation to his material. This discipline, however, should not be taken to mean that the soloist is deprived of any chance to demonstrate his virtuosity. But the work is carried by an almost symphonic linking of the accompanying orchestra and the percussion section, clearly evident in the first bars of the Adagio opening movement: like a kind of commentary, the first, organically growing comments from the percussion rise up out of a twelve-note opening chord. In this movement, it is mostly metallic sounds that we hear from the percussion. The Scherzo that follows is dominated by the sounds of wood and drumskin, and this goes as far as a cadenza for the marimba, which audibly takes its character from the B-A-C-H motif that is central to this sonata-form Allegro vivace. The light-hearted interchange is followed by a Lamentation in which two famous composers meet up. BACH (in English notation B flat-A-C-B) encounters Dimitri Shostakovich (DSCH: in English notation D-E flat-C-B flat) in such a way that a complete twelve-tone scale is created from the intervals between the two series of notes and an another group of four notes. This twelve-tone scale is then used as the basis for a meditative tribute to the great Russian composer. Altogether in keeping with the Classical tradition, the concerto closes with a virtuoso flourish, which conceals a sonata movement structure rendered less rigid by two vibraphone cadenzas. With beaten instruments at its core, Hummel´s concerto is exotic, as though partaking of primal sounds. Its evocative power is transmitted within a splendidly composed envelope of contemporary music. The work — a nightmare shifting time signatures — is impressionistic and portentous as it builds emotional tension with broad, sweeping motives and percussive effects. Hummel exploits the string sections for their percussive qualities — there´s a whole lot of plucking going on. With eerie violin glissandos in the slow third movement, Hummel creates a string analog for the percussionist´s raking a tuning fork across variety of cymbals and a large Chinese gong with curled edges called a tam-tam. In each of the work´s four movements, Hummel creates layer upon layer of tonal poetry. The musical tension never lets up. From Saturday´s audience reaction, it might be said as well that the psychological tension never lets up either — no coughing or shuffling between movements. When it was over, a cascade of applause broke over the stage where beamed a perspiring Weinberg, who said afterward he´s ready to do it again, any time, any place. What kind of melodic fireworks are possible on marimba and vibraphone was demonstrated by Sadlo as soloist with the Radio Symphony Orchestra in the Konzerthaus. Bertold Hummel's virtuoso "Concerto for Percussion and Orchestra" is a showpiece for the "King of the Sticks". With sensitive instincts, he explored in the Adagio the sound world of various cymbals, bringing them to life with gentle tremolos. As nimble as ping-pong balls, the sticks flitted in hair-raising tempo across the marimba. Peter Sadlo's solo performance with the Radio Symphony Orchester in the Konzerthaus brought stamping applause. With cymbals and bongos, gong and chime, xylophone or marimba, Sadlo made real music. He not only demonstrated that the times are gone in which the percussion only had the role of a support in the loud passages. In Bertold Hummel's "Concerto for Percussion and Orchestra" he had a work in his powerful, agile hands which was worth the efforts of the soloist. Hummel begins with tones of Bruckner. In an Adagio, the pathos of the trombones dominates. The percussion replies to this with long-lasting echo and with the muted droning of the bass drum. In the other three movements, the percussion often takes the lead. The rattling and clatter, wooden beats and dry knocking, the swish of the opening cymbals, all developed together to a colourful dialogue in sound. With the drum-roll of a funeral march, with the song and sonority of chimes, the music passed through a Great Gate of Kiev. There were hints of Bartok motifs. But Hummel's opus remains something original and is in addition easily understood. Hummel has composed a genuine concerto, in which the percussion takes the place of the classical solo instrument, entering into lively dialogue with the orchestra and with its own cadenzas. This is something rare and the young percussionist Jasmin Kolberg (29) exploited the freedom offered with intense musicality. With her virtuoso and sensitive technique, she responded to the partly threatening, partly lamenting symphonic gestures of the orchestra with the surprising colours and rhythmic figures of the cadenzas. She even succeeding in the expressive feat of forming a "lament" from percussive sounds only before these were released into a whirling Vivace. She was rewarded by stormy applause with stamping of feet. With great skill and effect, Hummel used on the one hand delicate timbres, on the other powerfully expressive means (reminding us of Rolf Liebermann's Concert for Jazz Band and Orchestra) to enable the solo percussionist to present himself in a most effective way. J.S. Bach would certainly have found pleasure in this Concerto for Percussion and Orchestra by Bertold Hummel, whose second movement opens with a most original play on the famous B-A-C-H motif. Even in his church cantatas, Bach himself composed very rhythmically, much to the disapprobation of his pious Christian contemporaries ("dance-like trifles"). Bertold Hummel's Concerto for Percussion and Orchestra connects B-A-C-H (b-flat, a, c, b) with the twentieth century using D-S-C-H (d, e-flat, c, b) for Dmitri Shostakovich. A musicological homage of great expressive power, earnest and profound. On his new CD, "Percussion in Concert", artistic insight characterises Peter Sadlo's interpretation of this work (first performed in 1985). Sadlo is the sovereign tactical mastermind when he, together with the Bamberg Symphony Orchestra under Wolfgang Rögner, sets everything in motion that percussion has to offer. The expression "virtuosic" is a feeble rendering of what happens here. One is forced to think of those Indian gods with more than two arms at their disposal when one hears Peter Sadlo at work, awaking with wood and membrane his battery of percussion including vibraphone and marimba. Peter Sadlo offers percussion exceeding all you could imagine in effects, tension and timbre but not remaining purely effects. Bertold Hummel's Concerto for Percussion and Orchestra is the central work on this CD.